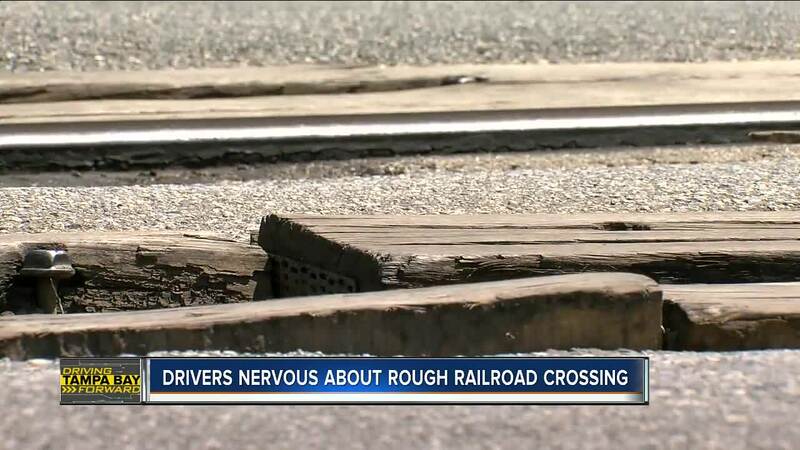 It’s a railroad crossing so rough, drivers say it’s ruing their cars. LAKELAND, Fla. — It’s a railroad crossing so rough, drivers say it’s ruing their cars. Drivers tell ABC Action News they first started reporting the tracks to CSX last year, but haven’t heard any response from the railroad company. The speed limit on Galloway Road in Lakeland is 40 miles per hour. But, driver Ryan Williams says to avoid damaging his car or worse, he has to slow way down. “We are going like 5 miles per hour over the tracks,” Williams says he must pass over the tracks each day to go to work. Last year Williams sent CSX Railroad an email complaining about the rough tracks but never heard back. So, he turned to ABC Action News and our Driving Tampa Bay Forward team to get answers. “There’s like a dip in there and every time we hit it, the car goes down,” Williams said. When we took a closer look at the crossing near Mt. Tabor Road, we noticed chunks of wood missing and railroad ties sticking up. A lot of the same signs ABC Action News has spotted at other aged railroads in Polk County, that have been recently fixed after we brought it to CSX’s attention. “I feel like my tires are going to blow out!,” driver Oscar Vazquez-Sanchez said. He lives near the tracks and says it’s not an easy track to drive over. However, that doesn’t stop other drivers from flying over the rough railway. In the past year, we unveiled there have been about five accidents at the intersection, including one fatality. Although, the crashes are not directly linked to the CSX crossing. “I've seen a car hit that pole, right there,” Williams said he saw an accident happen in front of him after jetting over the CSX crossing on Galloway Road. As if that was bad enough, according to Williams, there’s a worse crossing nearby. Sleepy Hill Road also has a CSX crossing that dips down so far drivers have to slow down significantly before crossing. But, this road is less traveled in comparison to Galloway Road. “That’s something CSX should repair ya know,” Williams said. ABC Action News questioned CSX on how much they allocate towards repairs like this. In 2017, the company budgeted out about 766 million dollars towards maintenance and increased their budget by another million in 2018. When we told them about the complaints about Galloway Road and Sleep Hill, a spokesperson said this hadn’t been brought to their attention yet but engineers would be looking into. "They don’t seem to be doing anything about it and I wish they would,” Williams said. At each CSX crossing, there is a tiny blue sign, with verbiage on it asking for problems or emergencies to be reported at 1-800-232-0144 or to fill out this form .